조선시대 주종장 가운데 김용암(金龍岩)·김성원(金成元) 등과 더불어 사장계(私匠系)를 대표하는 김애립(金愛立)이 순천 동리산의 대흥사 종으로 1665년에 주성한 종이다. 높이 121㎝의 크기로서 당시로서는 대종에 해당한다. 종의 외형은 상부가 좁고 아래로 가면서 약간씩 벌어져 마치 포탄과 같은 모습을 하였다. 간단하면서도 힘이 있는 쌍룡(雙龍)을 종 고리로 삼고 천판에는 큼직한 연화문대를 돌렸다. 천판과 만나는 종의 어깨부분에는 육자대명왕진언(六字大明王眞言)이 둘러져 있으며, 몸체에는 연곽대와 보살상 및 왕실의 안녕을 기원하는 전패(殿牌)가 마련되어 있다. 종신에 새겨진 문양은 전반적으로 섬세하고 화려하며 잘 정돈된 느낌을 보여준다. 이 종은 사인비구와 버금가는 기술적 역량을 지녔던 김애립 범종의 특징을 잘 살펴볼 수 있는 대표적인 작품인 동시에 보존상태도 양호하다. This bell was cast in 1665, originally for Daeheungsa Temple on Dongnisan Mountain in Suncheon, by Kim Yong-am and Kim Seong-won, who were both well-known bell makers in the Buddhist community, along with Kim Ae-rip, a leading private artisan. With a height of 121 centimeters, this is one of the larger temple bells of the day. It is shaped like a cannonball, with a narrow shoulder, a body that gradually widens toward the bottom, and a twin-dragon hook. The top plate has a lotus band and the shoulder is encircled with roundels carved with the six-word mantra of Vairocana, the Buddha of Great Illumination. The body has lotus panels, Bodhisattva images and a tablet containing the Chinese character ‘殿,’ meaning the king and symbolizing wishes for the prosperity of the royal family. These decorative patterns are arranged in an orderly manner and rendered delicately and beautifully. 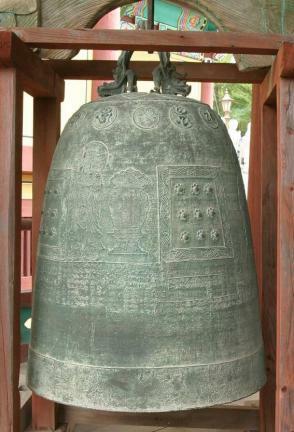 The bell clearly shows the characteristic traits of bells made by Kim Ae-rip, who possessed excellent bell-casting skills comparable to the famous bell caster Sain. It is preserved in good condition.